The series is comprised of daily reports produced by the DMP Detective Department on the movements and associations of pro-independence suspects between 29 May 1915 and 20 April 1916. The DMP reports were compiled by Superintendent Owen Brien and submitted to the Under Secretary for Ireland, Sir Matthew Nathan, at Dublin Castle. The reports describe Republican activity in Dublin during the 11 months preceding the Easter Rising. The final report in the series was written on 20 April 1916, just 4 days before the beginning of the Rising. The reports detail intelligence gathered at a number of key city centre locations, including the shop of Thomas J Clarke at 75 Parnell Street, the Irish Volunteers Office at 2 Dawson Street, the Irish National Forester’s Hall at 41 Parnell Square, and the headquarters of the Gaelic League at 25 Parnell Square. The reports record the interaction of suspects at these locations and attendance at meetings, as well as drilling and marching of Irish Volunteers. The movements of suspects in and out of Dublin were also recorded at the five main Dublin train stations: Kingsbridge [Heuston], Amiens Street [Connolly], Westland Row [Pearse Station], Broadstone and Harcourt Street, and at Dublin Port. 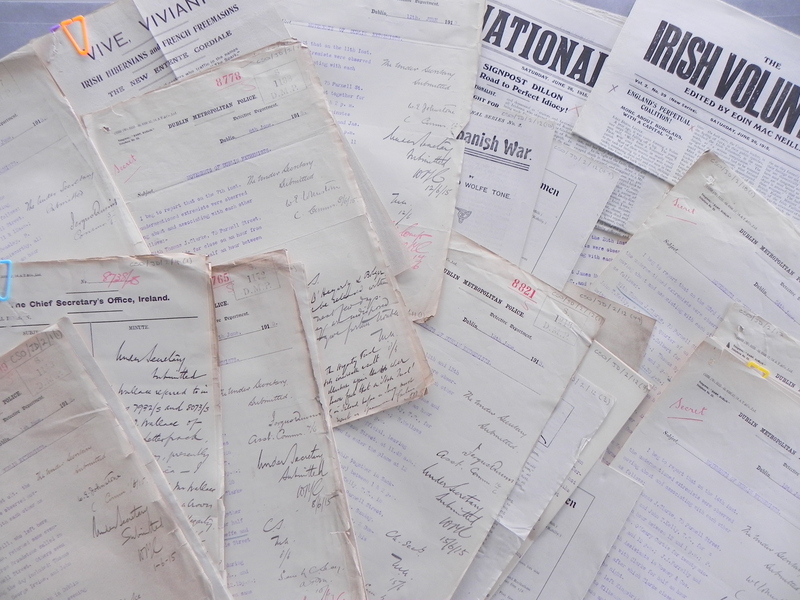 Major events which took place in 1915 and 1916 are recorded in the reports, including the funeral of the Fenian leader Jeremiah O’Donovan Rossa (1 August 1915) and the Annual Convention of Irish Volunteers (31 October 1915). They also record the travel of suspects to events outside of Dublin, such as the ‘annual pilgrimage’ to Bodenstown, County Kildare, for commemorations at the grave of Theobald Wolfe Tone (19 June 1915). Other activities recorded in the reports include anti-recruitment and conscription rallies, meetings of the Irish Women’s Franchise League, and protests against the imprisonment of revolutionaries under the Defence of the Realm Act. There are over 230 individuals referred to in the reports, principally members of the Irish Volunteers, the Irish Republican Brotherhood and Sinn Féin. The primary person of interest is Thomas J Clarke, who is mentioned in almost every report, while the other most frequently mentioned individuals include Pierce Beasley, Thomas Byrne, Con Colbert, Bulmer Hobson, Seán T Ó Ceallaigh, Seán Mac Diarmada, John McGarry, Joseph McGuinness, Herbert Mellows, Michael O’Hanrahan, William O’Leary Curtis, Michael Joseph O’Rahilly and James Joseph Walsh. The reports also contain copies of Nationalist newspapers, with attention drawn to ‘anti-British’ content, as well as pamphlets and election material. Publications include The Workers’ Republic, Ná Bac Leis, Nationality, The Hibernian, The Irish Volunteer, The Spark, Honesty and New Ireland. For more information on the individuals frequently mentioned in the reports, please see Who were the Extremists? For more information about the work of the Chief Secretary, please see Office of Chief Secretary for Ireland. 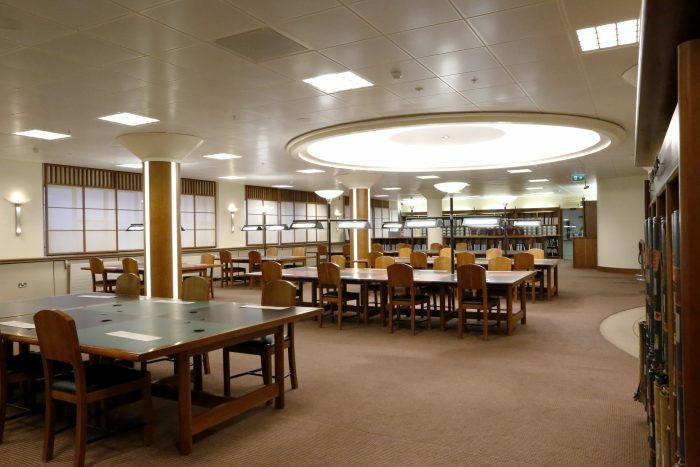 For more information about how the documents were conserved please see How we conserve the Movement of Extremist reports. The report of 1 June 1915, the first in the series, traces the movements and associations of a number of individuals, including Professor Eoin MacNeill and Thomas J Clarke with Thomas Byrne, Frank Fahy, George Irvine and Seán T Ó Ceallaigh. It also notes the movements of Ernest Blythe, Bulmer Hobson and Darrell Figgis and the meeting of JJ Walsh with Frank B Dineen, LJ O’Toole and Michael McCartan. A description is provided of the assembly of ‘about 34 Sinn Féin Volunteers without rifles’ in Rutland Square under the leadership of Joseph McGuinness. An issue of the Irish language newspaper Ná Bac Leis (29 May 1915) is included, with translations of the leading paragraphs for the authorities in Dublin Castle. For the full report see Dublin Metropolitan Police (DMP) Detective Department report on movement of Dublin extremists on 31 May 1915. The report of 2 June 1915 records visits to the shop of Thomas J Clarke, 75 Parnell Street, by JJ Farrelly, Major John McBride, William O’Leary Curtis, Thomas Byrne, Frank Fahy, Seán T Ó Ceallaigh and Professor Thomas MacDonagh. It also records the attendance of Bulmer Hobson, Jeremiah Joseph O’Connell, Patrick Ryan and Michael O’Hanrahan in the office of the Irish Volunteers, 2 Dawson Street, Dublin. A report is included of an anti-recruiting meeting at Beresford Place, Dublin, which was addressed by Patrick Ryan and BJ Fagan. The movements and associations of JJ Walsh from 37 Haddington Road to various addresses is noted, including meetings with M Dodd, Michael McCartan and LJ O’Toole. 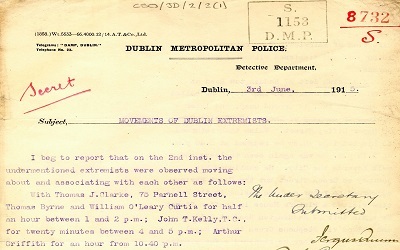 For the full report please see Dublin Metropolitan Police (DMP) Detective Department report on the movement of Dublin extremists on 1 June 1915. The report of 3 June 1915 records visits to the shop of Thomas J Clarke, 75 Parnell Street, by Thomas Byrne, William O’Leary Curtis, Seán T Ó Ceallaigh and Arthur Griffith and the movements of JJ Walsh and his associations with James Whelan. The attendance of John McBride, Thomas J Clarke, Seán T Ó Ceallaigh, Liam Mellows, Joseph McGuinness and the Reverend F Pollard at Police Court to witness the appearance of Seán MacDiarmada and John Milroy is noted, while the attendance of Michael Joseph O’Rahilly, Patrick O’Keeffe and Con Collins at Green Street Courthouse for the appearance of Hegarty and Bolger is also mentioned. The report includes details of the meeting of Bulmer Hobson, Thomas MacDonagh, Piaras Béaslaí, Éamonn Ceannt, John Fitzgibbon, Patrick Ryan, Con Colbert and L Moran at the office of the Irish Volunteers and an assembly of 34 members of the ‘Sinn Féin Volunteers’ and their march to Fairview and back. It concludes with details of the movements of JJ Walsh and his meeting with James Whelan. For the full report please see Dublin Metropolitan Police (DMP) Detective Department report on the movement of Dublin extremists on 2 June 1915. The report of 4 June 1915 records visits to the shop of Thomas J Clarke, 75 Parnell Street, by Thomas Byrne, Con Colbert, JJ Farrelly, Frank Fahy, Piaras Béaslaí and George Irvine. The meetings of JJ Walsh with Mr Wallace (Post Office official) and Seán T Ó Ceallaigh and Michael McCartan are also mentioned. Details are provided of the assembly of 30 Sinn Féin Volunteers under the command of Piaras Béaslaí and 44 Sinn Féin Volunteers under the command of Frank Fahy. A copy of the newspaper The Irish Volunteer (5 June 1915) is included. For the full report please see Dublin Metropolitan Police (DMP) Detective Department report on the movement of Dublin extremists on 3 June 1915. The report of 5 June 1915 records visits to the shop of Thomas J Clarke, 75 Parnell Street, by George Irvine, Thomas Byrne, Major John McBride, Piaras Béaslaí, Patrick Tobin, Con Colbert and Miss Bolger. The attendance is noted of Patrick Ryan of Sinn Féin at 25 Rutland Square, Dublin, and details are provided of the movements of JJ Walsh, including a meeting with his cousin, Patrick Walsh. A copy of the socialist publication The Workers Republic (5 June 1915) is included. 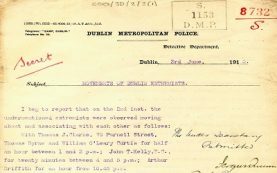 For the full report please see Dublin Metropolitan Police (DMP) Detective Department report on the movement of Dublin extremists on 4 June 1915. The report of 7 June 1915 records visits to the shop of Thomas J Clarke, 75 Parnell Street, by John Fitzgibbon, Thomas Byrne, Patrick Tobin, Seán T Ó Ceallaigh, Arthur Griffith and William O’Leary Curtis. Various meetings are reported involving Bulmer Hobson, Michael Joseph O’Rahilly, Patrick O’Keeffe, Con Collins, Thomas Byrne, Charles Wyse Power, J Connor, JJ Walsh, Michael McCartan, James O’Connor, Terence J McSwiney and Hugh O’Hehir. The movements and associations of JJ Walsh are noted. A report is included of a meeting of the Irish Women’s Franchise League at the Phoenix Park, which was addressed by Miss Cahalan and Miss Burke Dowling. A copy of the newspaper Na Bác Leis (5 June 1915) is included, with English translations of the leading paragraphs for the authorities in Dublin Castle. For the full report please see Dublin Metropolitan Police (DMP) Detective Department report on the movement of Dublin extremists on 5 and 6 June 1915. The report of 8 June 1915 records visits to the shop of Thomas J Clarke, 75 Parnell Street, by Major John McBride and Patrick Ryan. It also notes the attendance of Major John McBride, Éamonn Ceannt, Piaras Béaslaí, Joseph McGuinness, MJ Pender, Seán T Ó Ceallaigh, BJ Fagan, Richard O’Carroll, James Whelan, JJ Walsh, Daniel McCarthy, Michael Lynch and Hanna Sheehy Skeffington at Green Street Courthouse for the trial of O’Hegarty and Bolger. It concludes with a report of the movements and associations of JJ Walsh. For the full report please see Dublin Metropolitan Police (DMP) Detective Department report on the movement of Dublin extremists on 7 June 1915. The report of 9 June 1915 records visits to the shop of Thomas J Clarke, 75 Parnell Street, by James Murray and William O’Leary Curtis. It also mentions the attendance of Michael Joseph O’Rahilly at the office of the Irish Volunteers, 2 Dawson Street, and provides details of a labour meeting in Smithfield, addressed by James Connolly and attended by James Whelan and Richard O’Carroll. The meeting had been called in support of the Larkinite candidate Thomas Farren ‘for the Parliamentary representation of the College Green Division’. The report concludes with details of the movements and associations of JJ Walsh from his lodgings at 37 Haddington Road to various addresses throughout the city. For the full report please see Dublin Metropolitan Police (DMP) Detective Department report on the movement of Dublin extremists on 8 June 1915. The report of 10 June 1915 records visits to the shop of Thomas J Clarke, 75 Parnell Street, by John O’Mahony, Thomas Byrne and William O’Leary Curtis. Details are provided of the appearance and sentencing of Francis Sheehy Skeffington, Seán MacDiarmada and John Milroy at the Northern Police Court on charges under the Defence of the Realm Act. The hearing was attended by ‘several sympathisers’, including Thomas J Clarke, Piaras Béaslaí, James Connolly, Thomas Byrne, Major John McBride, William O’Leary Curtis, Seán T Ó Ceallaigh and Liam Mellows. A meeting of Bulmer Hobson, Patrick H Pearse, Piaras Béaslaí and Patrick Ryan at the office of the Irish Volunteers, 2 Dawson Street, is noted, as is an assembly of 36 members of the ‘Sinn Féin Volunteeers’ at Rutland Square and their march to Glasnevin in the command of Thomas MacDonagh. The report concludes with details of the movements of JJ Walsh. Election literature is included, which was distributed by the supporters of the ‘Larkinite candidate, Thomas Farren, in the College Green Parliamentary contest now proceeding’. For the full report please see Dublin Metropolitan Police (DMP) Detective Department report on the movement of Dublin extremists on 9 June 1915. The report of 11 June 1915 records visits to the shop of Thomas J Clarke, 75 Parnell Street, by Piaras Béaslaí with Éamonn Ceannt, Con Colbert and Liam Mellows, followed by Thomas Byrne, JJ Buggy, Seán T Ó Ceallaigh, Countess Markievicz and William O’Leary Curtis. A meeting is noted between Bulmer Hobson and Herbert ‘Barney’ Mellows and also between Con Colbert and John Fitzgibbon in the office of the Irish Volunteers, 2 Dawson Street. Details are provided of the assembly of 25 members of the Sinn Féin Volunteers at 25 Parnell Square, their amalgamation with ‘40 others of the same Corps and all without rifles in command of Frank Fahey’ and their march to Fairview. The movements and associations of JJ Walsh are noted, including the cancellation of his passage to America. For the full report please see Dublin Metropolitan Police (DMP) Detective Department report on the movement of Dublin extremists on 10 June 1915. The report of 12 June 1915 records visits to the shop of Thomas J Clarke, 75 Parnell Street, by Thomas Byrne and PA Sargent, followed at various stages by James A Deakin, Piaras Béaslaí, James Murray and Frank Fahy. The departure of Charles Wyse Power by train to Waterford is noted, as is the meeting of Thomas J Clarke, Edward Daly, James Whelan, James J Buggy, C Dowling, James Stritch and Seán T Ó Ceallaigh in 41 Rutland Square. The report also mentions the attendance of Bulmer Hobson, MJ O’Rahilly, George Irvine, TJ Sheehan, John Fitzgibbon and Patrick Ryan at the office of the Irish Volunteers, 2 Dawson Street, and concludes with a report on the movements of JJ Walsh. For the full report please see Dublin Metropolitan Police (DMP) Detective Department report on the movement of Dublin extremists on 11 June 1915. The report of 14 June 1915 details the movements and associations of Thomas J Clarke, Ben Parsons, Charles J Kickham, Seán T Ó Ceallaigh, Herbert ‘Barney’ Mellows, James J Buggy, Con Collins, Hugh O’Hehir, BJ Fagan, Michael J O’Rahilly, Frank Fahy and James Whelan. It also records a meeting between JJ Walsh and Patrick Semple, and with Patrick Walsh. An account is given of a gathering of around 300 people at a Suffragette meeting in the Phoenix Park, which was addressed by Miss Burke Dowling and Hanna Sheehy Skeffington. The proceedings were deemed to be of ‘no importance’. An issue of the Irish language newspaper ‘Ná Bac Leis‘ is included, with translations of the leading paragraphs for the authorities in Dublin Castle. The report also includes copies of Tracts for the Times, number 5 and National Series, number 2: The Spanish War by Theobald Wolfe Tone, published by Cumann na mBan. For the full report please see Dublin Metropolitan Police (DMP) Detective Department report on the movement of Dublin extremists on 12 and 13 June 1915. The report of 15 June 1915 records visits to the shop of Thomas J Clarke, 75 Parnell Street, by Thomas Byrne and Seán T Ó Ceallaigh, followed at various stages by Piaras Béaslaí, William O’Leary Curtis, JJ Farrelly and J McNamara. The departure of LJ O’Toole by train to Kilkenny is noted as is the meeting of Bulmer Hobson and Herbert ‘Barney’ Mellows in the office of the Irish Volunteers, 2 Dawson Street. Arthur Griffith and Major John McBride are observed separately in Dublin City centre. The report concludes with the movements of JJ Walsh and his associations with David Donovan ‘his carpenter friend from Cork’ and his visit to the home of his cousin, Patrick Walsh. For the full report please see Dublin Metropolitan Police (DMP) Detective Department report on the movement of Dublin extremists on 14 June 1915. The report of 16 June 1915 records visits to the shop of Thomas J Clarke, 75 Parnell Street, by Con Colbert followed at various stages by Thomas Byrne, Dr P McCartan, Mrs Wyse Power, James Murray and William O’Leary Curtis and Arthur Griffith. It is noted that everyone left except McCartan who ‘was seen to enter the apartments of Clarke overhead, where he put up for the night’. The departure of Thomas MacDonagh by train for Carlow is noted. The report concludes by detailing the movements of JJ Walsh, his associations with David Donovan and Patrick Walsh and his meeting with AC Harty and other GAA officials in the office of the GAA, 68 Upper Sackville Street. For the full report please see Dublin Metropolitan Police (DMP) Detective Department report on the movement of Dublin extremists on 15 June 1915. The report of 18 June 1915 records visits to the shop of Thomas J Clarke, 75 Parnell Street, by Thomas Byrne, followed at various stages by Joseph W Kenny, Seán T Ó Ceallaigh, Ben Parsons, George Irvine, William O’Leary Curtis, Piaras Béaslaí, JJ Farrelly and Richard O’Carroll. Michael J O’Rahilly, Bulmer Hobson, Arthur Griffith and William O’Leary Curtis are observed in Dublin City centre throughout the day. The report concludes with the movements of JJ Walsh who ‘was not seen to associate with any of the local suspects’. For the full report please see Dublin Metropolitan Police (DMP) Detective Department report on the movement of Dublin extremists on 17 June 1915. The report of 21 June 1915 records visits to the shop of Thomas J Clarke, 75 Parnell Street, by Thomas Byrne and Arthur Griffith, followed at various stages by James Murray, Ben Parsons, William O’Leary Curtis, Joseph McGuinness and Diarmuid Lynch, who called briefly following his arrival from Cork, and subsequently visited the office of the Gaelic League, 25 Parnell Square. The report also details the annual pilgrimmage to Bodenstown, County Kildare, for the Wolfe Tone commemoration, which was attended by ‘about 1,500 persons’, including contingents from the ‘Sinn Féin Volunteers, Citizen Army and National Boy Scouts’. Observed taking an active part in the proceedings were Michael Joseph O’Rahilly, Éamonn Ceannt, TJ Sheehan, Frank Fahy, Edward Daly, Thomas Byrne, Patrick H Pearse, James Connolly, William P Partridge, Peter Doyle, Bulmer Hobson and Countess Markievicz. It is noted that Thomas J Clarke, James J Buggy, Seán T Ó Ceallaigh, JJ Walsh, John O’Mahony, George Irvine, Patrick O’Malley, Diarmuid Lynch, Herbert ‘Barney’ Mellows and Joseph McGuinness had travelled by train. The report also records the movements of JJ Walsh and a protest against the imprisonment of John Milroy and Seán MacDiarmada, which was addressed by Hanna Sheehy Skeffington. A copy of the Irish language newspaper Ná Bac Leis is included, with translations of the leading paragraphs for the authorities in Dublin Castle. For the full report please see Dublin Metropolitan Police (DMP) Detective Department report on the movement of Dublin extremists on 19 and 20 June 1915. The report of 22 June 1915 records visits to the shop of Thomas J Clarke, 75 Parnell Street, by Joseph McGuinness, followed at various stages by Con Colbert, Éamonn Ceannt, Diarmuid Lynch, Thomas Byrne, George Irvine and Frank Fahy. Herbert ‘Barney’ Mellows is observed in the office of the Irish Volunteers, 2 Dawson Street, and the movements of JJ Walsh in various locations throughout Dublin City are noted. The report concludes with a description of the assembly of 34 members of the ‘Sinn Féin Volunteers’ at 41 Parnell Square and their march to Fairview under the command of Edward Daly. For the full report please see Dublin Metropolitan Police (DMP) Detective Department report on the movement of Dublin extremists on 21 June 1915. The report of 24 June 1915 records visits to the shop of Thomas J Clarke, 75 Parnell Street, Seán T Ó Ceallaigh, followed at various stages by Con Colbert, Thomas Byrne, Hugh O’Hehir, JJ Walsh and William O’Leary Curtis. A meeting is noted between Bulmer Hobson, Frank Fahy, Herbert ‘Barney’ Mellows, Arthur Griffith, Éamonn Ceannt and Con Colbert in the offices of the Irish Volunteers, 2 Dawson Street. The assembly and march of around 30 ‘Sinn Féin Volunteers without rifles’ from Parnell Square to Clonliffe in the command of Henry Manning is reported. An issue of the newspaper The Irish Volunteer is included, along with a copy of the ‘new Sinn Féin Journal Nationality‘ and a copy of The Hibernian, a weekly publication of the Ancient Order of Hibernians, which is noted as an ‘American Alliance’. For the full report please see Dublin Metropolitan Police (DMP) Detective Department report on the movement of Dublin extremists on 23 June 1915. The report of 25 June 1915 records visits to the shop of Thomas J Clarke, 75 Parnell Street, by JJ Farrelly followed, at various stages, by Diarmuid Lynch, William Shortall and Edward Daly and William O’Leary Curtis. It also records the meeting of Herbert ‘Barney’ Mellows with Michael O’Hanrahan in the office of the Irish Volunteers, 2 Dawson Street. The return of Patrick O’Malley to Galway by train is noted. The report concludes with a description of the assembly of ‘about 45 Sinn Féin Volunteers without rifles’ at 41 Parnell Square and their march towards Fairview under the command of Frank Fahy. A copy of the socialist newspaper The Workers’ Republic is included. For the full report please see Dublin Metropolitan Police (DMP) Detective Department report on the movement of Dublin extremists on 24 June 1915. The report of 28 June 1915 records visits to the shop of Thomas J Clarke, 75 Parnell Street, during the course of the 26 and 27 June, by Joseph McGuinness and James Murray followed, at various stages, by Diarmuid Lynch, Con Colbert, Arthur Griffith, William O’Leary Curtis, W Parsons, James J Buggy and McGuinness a second time. The departure of Denis McCullough, Frank Fahy and Liam Mellows by train to Tullow, County Carlow, is noted. This was followed by ‘around 2,000 persons’ including Jeremiah Joseph O’Connell, Edward Daly, Seán T Ó Ceallaigh, Charles Wyse Power and James Stritch, who travelled by ‘two excursion trains’ for the County Carlow Feis. The train is also reported to have carried ‘sixty members of the Citizen Army carrying rifles and thirtynine members of the National Volunteers (Redmonite Section) also with rifles’. For the full report please see Dublin Metropolitan Police (DMP) Detective Department report on the movement of Dublin extremists on 26 and 27 June 1915. The report of 29 June 1915 records visits to the shop of Thomas J Clarke, 75 Parnell Street, by James Murray, Con Colbert, Seán T Ó Ceallaigh and Frank Fahy. It is noted that Clarke was not present as he was ‘fitting up his new residence, 10 Richmond Avenue, Fairview’. The movements of JJ Walsh and the return to Dublin from Carlow of Liam Mellows and Denis McCullough are reported, as is the departure of Jeremiah Joseph O’Connell by train to Carrickmore. The report also mentions the presence of Patrick Ryan at the office of the Irish Volunteers, 2 Dawson Street. For the full report please see Dublin Metropolitan Police (DMP) Detective Department report on the movement of Dublin extremists on 28 June 1915. The report of 30 June 1915 records visits to the shop of Thomas J Clarke, 75 Parnell Street, by Joseph McGuinness followed, at various stages, by Major John MacBride, Frank Fahy, Ben Parsons and Reverend FS Pollard of the Ancient Order of Hibernians. The departure by train of Denis McCullough to Enniskillen and of Bulmer Hobson and Seán T Ó Ceallaigh to Tullow is noted. The movements of JJ Walsh and Countess Markieviez are mentioned, along with the presence of Diarmuid Lynch at the office of the Gaelic League, 25 Parnell Square. The report details the assembly of 80 members of the ‘Sinn Féin Volunteers without rifles’ at 41 Parnell Square and their march towards Fairview under the command of Frank Fahy. For the full report please see Dublin Metropolitan Police (DMP) Detective Department report on the movement of Dublin extremists on 29 June 1915.